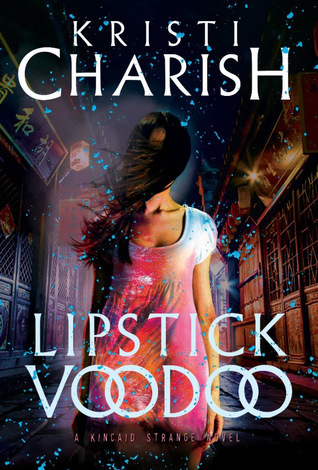 It was nice getting back into the world of Kincaid Strange with Lipstick Voodoo, and reading it has made me realize how much I’d missed this kind of urban fantasy. Thing is, I’m just not reading as much of the genre as I used to. I’ve gotten pickier these days, and my UF reads are mostly limited to series I’ve already started and to only books that I feel are breaking the mold. While I would hesitate to label the Kincaid Strange novels as “typical”, admittedly they do follow a certain type of formula, containing a lot of the tropes often associated with the genre. At the same time though, I’m guessing that’s where all the warm and fuzzy down-earth-vibes I’m getting are coming from. Lipstick Voodoo is the sequel to The Voodoo Killings, and picks up soon after the events of the first book. As one of the only few licensed (and legit) paranormal practitioners on the entire west coast, Kincaid Strange has got her hands full with new jobs, and yet she’s still always nearly broke. At the moment, simply trying to keep her zombie roommate “alive” and in one piece is draining her bank account. Nathan Cade used to be a pretty big deal on the 90’s Seattle grunge scene before he died in a boating accident at the height of his fame, and until recently, he’s spent the last two decades or so continuing his musical career as a ghost. But now, due to a magical ritual gone wrong, he is trapped in an animated corpse that is slowly decomposing, and if Kincaid doesn’t find a solution to the problem soon, his spirit will die along with its vessel. Meanwhile, Kincaid is also in trouble with Gideon, the ghost of a sorcerer who is currently furious with her for destroying a body he had intended to inhabit. Now Gideon figures she owes him a huge debt, and he’s not going to rest until it is exacted. As if her life wasn’t complicated enough, Kincaid is also trying to sort out her feelings for Aaron, her ex-boyfriend who is a detective on the police force. The reopening of a twenty-year-old paranormal case has led to Aaron calling her up for her expertise, and the fact that it involves a murdered rocker who was a contemporary of Nathan Cade’s has both the detective and our protagonist wondering if her undead roommate may have had something to do with the death. Lipstick Voodoo was everything I wanted—fast and fun, with just the right amount of offbeat humor and charm. We mostly have our main character to thank for that. In some ways, Kincaid Strange reminds me a bit of a modernized Anita Blake (but savvier and less raunchy), most likely due to her supernatural ability to draw energy from the otherworld to fuel her necromantic magic. But while she may conform to the familiar archetype of the urban fantasy female protagonist (e.g., strong and independent, to the point of preferring to work alone; having few female friends and strained relationships with remaining family members; always getting in trouble with the powerful head honchos of the paranormal community because of her snarky, sometimes impetuous attitude; dealing with a tricky situation with an on-again-off-again beau, etc., etc., etc. ), Kincaid also possesses a number of qualities that endeared me to her personality. For one thing, unlike a lot of bull-headed heroines who can’t see past their own self-importance, she knows what her weaknesses are and isn’t afraid to take an L if it means fighting another day. She’s also very loyal to the people she cares about. And slowly but surely, she’s coming around to the idea that it’s okay not to have to fight one’s battles alone. On the world-building side of things, I’m once more impressed. As any fan of this genre knows, establishing the setting and a “sense of place” is always a huge component of an urban fantasy series, and I like how Kristi Charish is continuing to build upon her paranormal version of Seattle with an eye towards detail and atmosphere. Not only has she populated her world with all manner of creatures from ghouls to ghosts, she’s taken care to include examples of how the presence of the supernatural has also impacted everyday life. Incorporating the musical culture of the city into her story was also a stroke of genius; I’d liked this aspect when I read the first book and was thrilled to see it carried through to this sequel. Lipstick Voodoo also ties up several plot threads from the previous novel while introducing new ones to look forward to. For a series that only has two books out right now, Kincaid Strange is already flowing like an extremely well-oiled machine with the promise of even more quirky and entertaining stories to come. I am looking forward to the next adventure starring our plucky heroine. Audiobook Comments: I made the switch from print to audiobook with this installment, a decision I do not regret at all. I generally find that most urban fantasy works great in audio, especially with a book as light and fun as Lipstick Voodoo. As a bonus, Susannah Jones was fantastic as narrator, possessing the perfect voice and cadence to portray Kincaid Strange, but she also delivered incredible performances for all the other characters. If you’re an audiobook listener thinking about checking out this series, I highly recommend this format. Ooh this one caught my eye because of Kristi Charish- I read one of her Owl series books. This sounds really unique and fun and it sounds like she hits the right notes with the humor as well. Your review is really convincing Mogsy. And let’s not forget the so lovely cover. Oh yes, I should have given a shout out to that beautiful cover too! They also put out a new one for the first book to match, and it’s stunning as well! This sounds like a good one. I do enjoy a good UF. Maybe one to pick up once I finish off some other ongoing series. I’ve not started this series and this is a reminder to catch up with Owl – who I left in rather a precarious situation for my last read. I’ve been switched off from new urban fantasy as it all seems a bit predictable. The plots are being stuffed with romances that have no chemistry, there seems to be a glut of supernatural PI adventures that don’t have much new…I’m struggling to get excited by a lot of the new stuff! Hmm I’ve never heard of this series. I’ll have to add it to my audibles. Lovely cover too.